Shown last month at the Apple Expo in Paris, ViewSonic today officially launched its "Made for iPod" ViewDock desktop widescreen LCD displays. Although no information about the products has yet been posted to the company's Web site, the 19- and 22-inch display sport a 16:10 aspect ratio (offering native resolutions of 1,440 by 900 and 1,680 by 1,050 pixels, respectively) with 700:1 contrast ratios,5 ms response times, and integrated stereo speakers and subwoofer (2.5 watts and 3 watts, respectively). 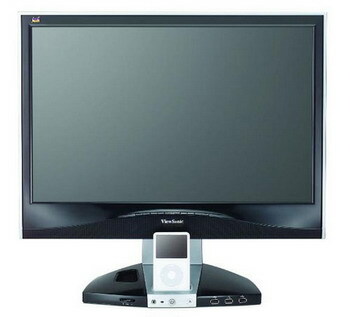 And, of course, an iPod dock at the base of the monitor, so users can watch iPod videos and view album art and images on the big screen. "As a display leader, ViewSonic is constantly finding new ways to bring consumers greater simplicity and convenience to their digital lifestyle," said Jeff Volpe, ViewSonic America's VP of marketing. "In addition to providing the performance people expect from ViewSonic, our ViewDock displays offer innovative options, such as the integrated iPod dock, to allow consumers to easily make the most of their digital devices, content and desktop real estate." The ViewDock displays also sport four USB 2.0 ports (presumably for use connected to a Mac or PC), an 8-in-1 media card reader, and a built-in microphone for VoIP and audio chat applications. The units sport sleek black bezels. Expect the ViewDock displays to hit retailers in time for the end-of-year holidays at prices starting at $329.